Back in our chandlery we do stock a wide variety of lifejackets & buoyancy aids, Crewsaver, Baltic, Spinlock,Typhoon, Secumar to name but a few makes! We also sell Puddle Jumpers which are a swimming aid for children up to and around five years old. 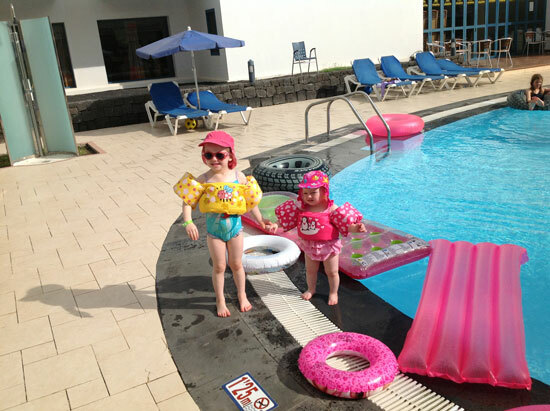 Parents taking kids abroad for a holiday round the pool also swear by them including Storrar Marine director Andy Burgess who sent us the image and the conversation he had poolside in Lanzerote with his eldest daughter Abi... Andy: "Abi hold Sophie's hand while I take a photo" Abi: "Daddy can I have a look at the photo?" then...SPLASH!!!!! Andy advises and I quote....true story but at least she floated with her head out of the water! 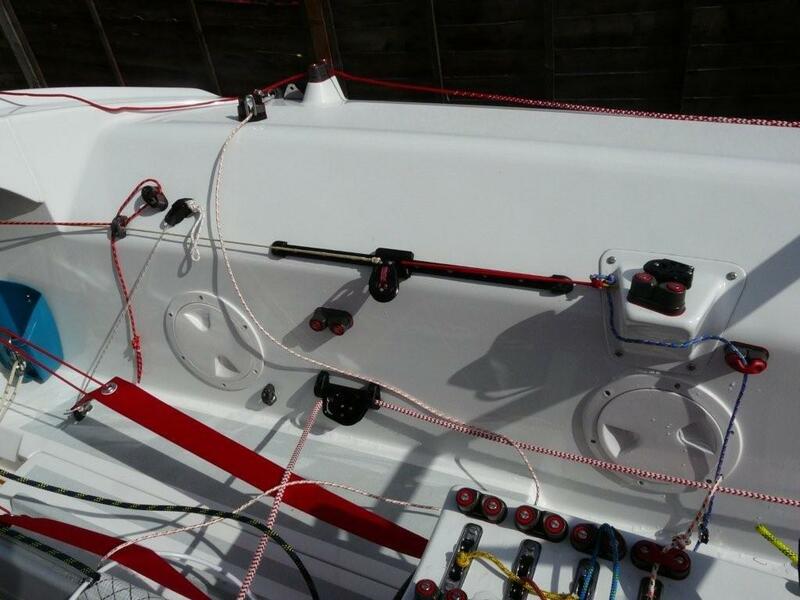 This entry was posted in General Interest, Safety and tagged Baltic, Crewsaver, Secumar, Spinlock, Typhoon on October 31, 2012 by Iain Forrest. "Fair is foul and foul is fair, Hover through the fog and filthy air." Shakespeare wasn't a sailor, but a terrific wordsmith, even now these lines from Macbeth remind me of the time we set off through the sea-lock from Crinan Basin in 1968 heading north for Oban in the tidal swirl past Corryvrekan. Two hours after setting off the fog closed down visibility to about 200m. The only instrument we had onboard those days was an echo sounder; GPS was but a gleam in some young man's eye. There was no point in turning back, so we kept on, navigating by the 'Barking Dog' technique used back then. Keep on a depth countour; if you hear a dog bark, shout out "Where are you?" In fact, the reply was "Easdale" which was a bit further than we expected, but we manage to drop a hook in there and spend a comfortable night. Many years on, GPS came along and barking dogs were redundant! My first GPS was a handheld Garmin 12. It didn't have mapping capabilities so I sailed round the safe perimeter of the waters around my base to create one. Then the day came - a thick fog with visibility about 50m and I set off through the narrows with the Garmin ready. After half an hour, though I knew exactly to the metre where I was, I simply bottled out and turned tail for home, my handheld GPS showing the way. Now if I had radar? Radar is a second degree of vision and a very useful thing aboard if you know how to read it. 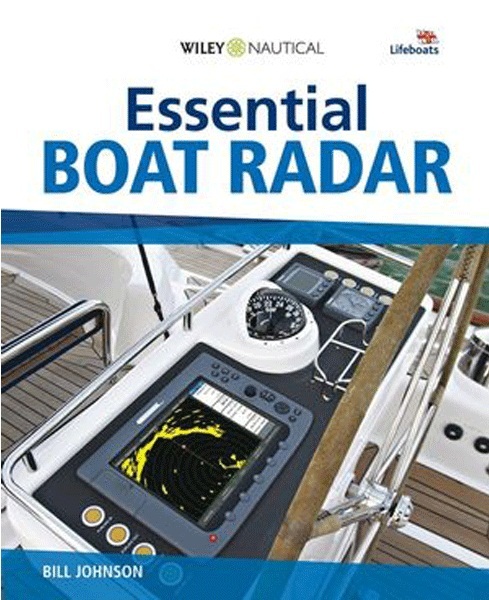 This entry was posted in Electronics, Tips and Advice and tagged garmin, Lowrance, Raymarine on October 29, 2012 by Iain Forrest. Cold snap catches us out! Luckily for Lilly, pictured left (Staff member Claire's daughter) the purchase of some Sealskinz Children's Mittens before the weekend were much appreciated on Saturday. Warm, toasty dry hands after three and a half hours of snowball fights and snowman building! 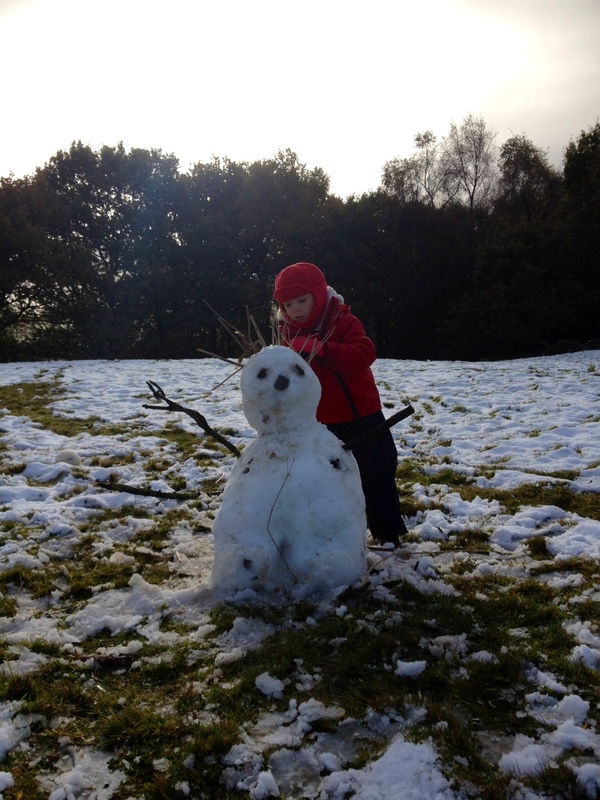 This entry was posted in General Interest, Tips and Advice and tagged Freezeban, Sealskinz, Tube Heaters on October 29, 2012 by Iain Forrest. This entry was posted in General Interest and tagged Harken on October 22, 2012 by Iain Forrest. 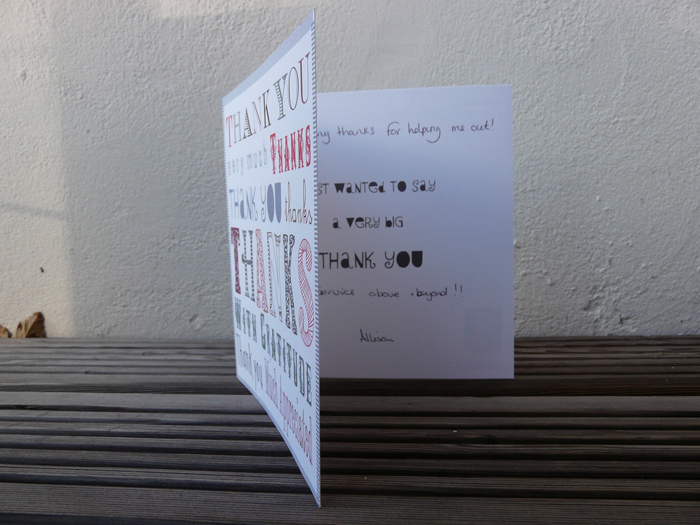 It helped make our day when we opened the post this morning and read this card. The lady who took the trouble to send it was in our chandlery last week, ordered a Gill jacket which I think she had seen on the website and then left. After realising her tyre was flat she was back in the shop only two minutes later asking if it was ok to drive her car off our premises and onto the road (she didn’t want to clutter the car park). The ‘other Rob’ took one look at the tyre and said NO, if you move the car then you could damage the tyre beyond repair if it isn't already! Gallant Rob (not your author) rolled up his sleeves and with a little help from Allison and her son the wheel was changed in double quick time. Thanks for the card and thanks to member of staff Rob for helping a damsel in distress! This entry was posted in General Interest and tagged Gill on October 18, 2012 by Iain Forrest. Disaster struck at the local leisure pool the other day as the pet whale stopped spouting (shame our politicians still do). Fortunately, we had a Henderson Mk V (manufactured by Whale of course) in stock, no more tears, crocodile ones, or is it the Loch Ness Monster in the foreground sporting another Whale pump! This entry was posted in General Interest and tagged Whale on October 17, 2012 by Iain Forrest. 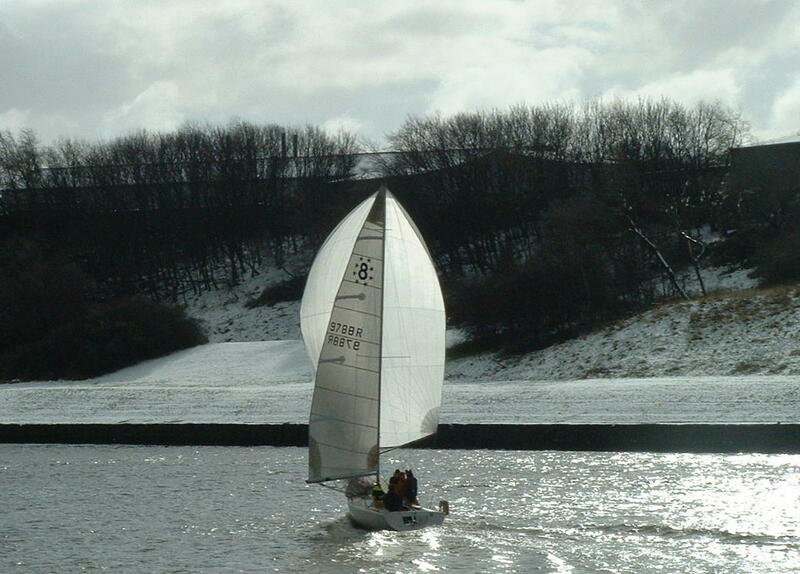 First of the St Peters Winter-series took place yesterday on the Tyne, conditions were typical of the area they sail in, light & flukey (according to co director Andy) but then they didn’t win! Maybe they should have polished the hull a little more with the Mclube Hullcote. Never mind, 4th is better than last! Luckily the rain passed just as the race started. Andy tells me he was glad of his Deckvest Lite as with the light winds the helm had him in all sorts of strange places, still praising the grip he gets from his Musto boots as the foredeck on the sports boat can get rather slippy when wrestling with the masthead kite! 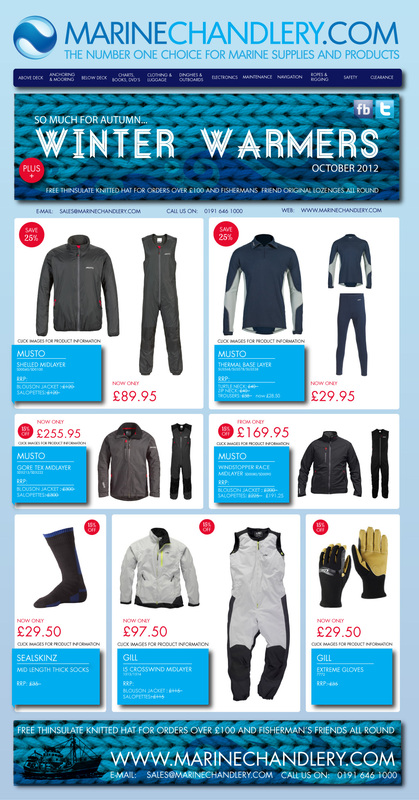 This entry was posted in General Interest, Race News, Safety, Tips and Advice and tagged Mclube Hullcote, Musto, Musto boots, Spinlock, Spinlock Deckvest on October 15, 2012 by Iain Forrest. Let’s hope you don’t ding your boat this weekend however if you do have the misfortune to ‘caress’ the windward boat on the start line or have an unfortunate port and starboard, fear not help is at hand. SP have just introduced to the market place a rather good boxed repair kit (great for your tool kit). It contains a load of essentials for fast strong repairs, including over 350 ml epoxy, microballoons, colloidal silica, microfibers, calibrated mixing pots etc etc! Priced at only £ 39.95 dare I say it ... it will also make an excellent Xmas prezzie. This entry was posted in General Interest, New Products, Tips and Advice and tagged SP on October 12, 2012 by Iain Forrest. Was at Amble marina yesterday morning putting the finishing touches to a replacement canopy we have made for a large powerboat and for the first time this autumn I encountered ice on the decks. This reminded me that I must get the tube heaters back on display at the chandlery of which we have both the original style but also a load of the new thermostatically controlled ones in. I must also check our stocks of Freezeban, a non toxic antifreeze which we/customers use to protect water systems, including fresh water pumps in the winter. If you have taken the decision to stop sailing already I would always suggest that you remove all sails as well as your covers & canopies (unless they are protecting bright work or instruments)in order to protect them from the weather. Putting a simple PVC cover over helps keep rubbish out of cockpits etc. I also suggest you give the boat a good hose down and get a coat of polish on asap, Starbrite, Meguiar's & Farecla are some of the makes we stock, my favourite? Meguiar's. This entry was posted in New Products, Tips and Advice and tagged Farecla, Freezeban, Meguiar's, Starbrite on October 11, 2012 by Iain Forrest. This entry was posted in Special Offers on October 10, 2012 by Iain Forrest.